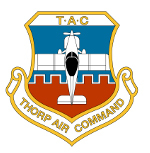 Thorp Air Command - T18.net • View topic - Horizontal tail trim. Post subject: Re: Horizontal tail trim. While reading N883FF logs and other papers, I found an entry that states the trim motor is a Volvo windshield wiper motor. Was this a common application in "the day"? this plane was built from 1970 to 1985. I also have trim position indicator that consists of 3 lights. The wiring diagram is in the aircraft manual. The lights are mounted on the lower left sub-panel near the headphone jacks. I'm thinking they use the microswitches that control the limits of trim? N926WM has a little copper U-bracket with a positive wire connected to it that acts as a basic limit switch (well, more like an indicator) for both up and down lighting up on the panel. It's a twelve count full throw on the jack screw. Bin dare since first flight at N633PM in 1971. Its so simple, that if it ever craps out, I'll put a trunk monkey in the back with an LED flashlight, two soup cans and a string to tell me trim position. I like the idea of the Trunk Monkey ! Trunk monkey is the Son Fraser never had. Well, I don't have a trunk monkey, but I do have a tire iron. Marilyn had a trim failure while on her third lesson, the roll pin broke at the motor end of the driveshaft. hoping an indicator light would come on. They had an interesting flight back to the home drome. So I fixed that and got to know this system better. The micro switches are for indication only on N883FF, they are not limit switches. So I cleaned and fiddled with it until I realized that it's old and needs a refurb. I've bench tested it and I'm making the hardware now. Stuart G asked me to elaborate on my trim indicator experiment, so you guys are in for it now!! Here is a pic of back of the hardware. The "c" lead goes to the S terminal on the meter. 12V goes to the "I" terminal on the meter. The Meter ground is either stud on the case that holds the mounting bracket. The part number is confusing; this is a sender made for use on single or dual pilot station vessels. Any sender for Mercruiser alpha II and Bravo outdrives will work, in fact, many brands use the 10 to 167 Ohm (down to up) sender. This is one of many that could work. Last edited by SHIPCHIEF on Sat Jul 07, 2012 9:47 pm, edited 1 time in total. Faria is a maker of replacement gauges, which are priced very reasonably, Google "Mercruiser trim gauge" and you can see many styles. I like the ones with meter movement similar to the one I have, with down and up deflection to remove doubt when reading the meter. Knowing that the sender is a 10 Ohm to 167 Ohm pot with 1/4 turn, a generic pot of 500 to 1K Ohm could be used and the geometry of the arms made accordingly. Last edited by SHIPCHIEF on Sat Jul 07, 2012 9:54 pm, edited 2 times in total. It's shaped to hold down a clear plastic gasket that keeps the wires in the grooves. The arrow on the "wrench" is pointed to the reference mark on the sender shaft. Naturally I made one with the arm pointed straight out from the reference point. At full deflection, the arm covered a mounting hole. Bummer. I have just been looking at the trim mechanism using the traxis drive shaft. It seems to be a good solution. I am curious to know what others think is needed to reach an adequate safety standard for securing the universal joints to the drive shafts. Each universal appears to be of plastic and is secured onto the shaft with a pin which is threaded on one end and is approximately 3/32" diameter. The universal itself is made of metal and has a similar size shaft which is kept in place with a cir clip at each end. These things take a pounding when in model race cars but is this setup adequate as is in an aviation setting or does it need more? I would anticipate using loctite on the threads and was planning to test one of the plastic universals to determine it's maximum torque capability but possibly the greatest risk is from vibration loosening the circlips. Just to follow up on this old but outstanding thread......when installing this motor, make sure you have the Grainger gear motor oriented in the proper position. The shaft is off center on the gear motor housing, and upon installation, the shaft should be closest to the top skin (see Bill's photo on page one of this thread). If you install the gear motor in a different orientation, the Traxxis trim shaft (in black in Bill's photo) will hit the (tubular) horizontal tail spar when the control stick is in full up (back/aft) position. I just realized this the hard way! 1) The Dayton 2L009 gearmotor used in the first post has been superseded by 52JE52. 2) I ended up not needing the extra u-joints. They are cheap enough to order just in case. 3) I initially had the wires on the motor reversed and was driving past the limit switches on the first couple of attempts. 4) If the motor is mounted too high then nuts cannot be installed on the mounting studs. 5) My jackscrew used a roll-pin to secure the original driveshaft to it. I was able to use that same hole to use the pin provided with the driveshaft to secure the u-joint. The u-joint had to be bored a little deeper to fit. 6) The gearmotor has a 5/16" output shaft. I bored out the u-joint to fit and installed a setscrew against the flat side of the output shaft. Time will tell if that is a lasting fix. 7) The limit switches need to be activated as close to the button as possible. The movement required to activate the switches at the end of the arms can be considerable and it takes a lot more travel to close the switch than to open it. Just using a hose clamp on the tube wasn't working so I welded up an "L" to give more reach and hose clamped that to the tube. 9) The CG moved about 0.1 inches aft on my installation. I did not install any indicators or lights although I am considering an "in transit" light to show when the system should be moving and to let me know if I hit a limit switch. I installed my switch near the old wheel location thinking that would work well because I was already used to reaching for the trim there... I may move that switch a little closer. I had no idea how nice it is to fly with electric trim. I usually prefer manual controls and this system is a little slower than I am used to but, for what it is worth, I highly recommend this mod.